Jack 20's Story . . . 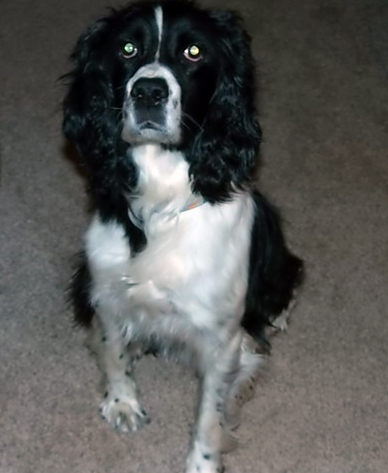 Original: "If you’re looking for a wonderful Springer to give you years of companionship and love, this is your fellow." Meet Mr. Personality! Jack has won the hearts of everyone who has come into contact with him since he was rescued from a hoarding situation in Tennessee. While he reportedly was living outside, he is a complete gentleman in the house. He’s friendly, playful, cuddly and funny…what a guy! Since coming into foster care, Jack has adapted very well to the household routines and to sharing his space with the resident Springer and the adult humans in the house. He hasn’t met any children since he came into foster care, but has reacted with friendliness to children he has met on his daily walks. He soon will get to go to a Christmas party attended by many children and his foster mom thinks he will be great with them. Jack has great manners! He doesn’t counter-surf or chew inappropriately, nor does he resource-guard his food or toys from the resident Springer or from his humans. He has quickly learned to stay out of the kitchen when meals are being prepared and to stay off the furniture unless invited up. A calm guy, Jack has exhibited no unusual fears. He has a tendency to bark at the door, but does not charge or jump when people come in. 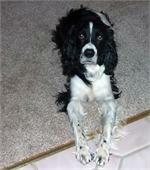 This sweet Springer is completely housetrained and will stand by the door when he wants to go out. If his foster mom doesn’t notice soon enough, he will start dancing around to get her attention. In the car, he rides well and enjoys his travels calmly. Jack is also crate-trained. He sleeps in the crate at night and will retreat to it during the day. However, he does not like being restrained in it when his foster mom goes out, especially since the resident Springer is free. Jack does well if he’s given free roam of the house when left alone, although there is evidence that some rough-housing with his dog buddy has occurred while mom’s been away. No real harm has been done, though. Jack loves to go for walks! Nothing is more exciting to him than seeing his harness and leash come out! He likes playing fetch with the tennis ball and really loves playing with the resident Springer. Their races around the house are becoming legendary! Grooming has been a breeze with Jack; he tolerated his bath very well. When he arrived, he had numerous mats, but quietly stood while they were cut away and combed out. He doesn’t mind having his ears or paws worked with. And he loves being brushed! Hey, a guy likes to look handsome! This sweet, handsome, gentle boy should be a great fit in any home. If you’re looking for a wonderful Springer to give you years of companionship and love, this is your fellow. You will lose your heart to him in an instant.